“Respect for Diversity” by Plachte-Zuieback Art Glass. 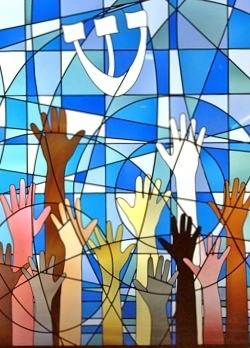 Stained Glass Window: Values: Abraham Heschel School, Northridge, California. RACReflects. 18+ Things You Can Do: Embracing Racial Diversity in Our Jewish Communities. •As you explore aspects of racial diversity in the Jewish community and racial justice, share what personally resonates with family members and dear friends. Share also at upcoming committee and/or Board meetings. •Share the “Who Are Jews of Color?” fact sheet. Reflect with fellow congregants on how it mirrors/ does not mirror your congregational and/or Jewish communal experiences. •Join the Tent conversation, #EmbracingRacialDiversity, to share ideas, questions, and resources. •Read a book or article or watch an ELI Talk or TED Talk recommended on the resource page. Share that resource with other members of your Jewish community. •“Like” relevant organizations so their posts are added to your Facebook feed, or subscribe to their email blasts. •Write a blog post , article, or book review for your synagogue/Jewish communal organization/ school/camp’s newsletter. •Choose a book or chapter from one of the books an upcoming Sisterhood book club meeting (or similar) from an author who tells a Jewish story outside the European-Ashkenazi Jewish experience. Start a RAC Reads or racial justice book club in your congregation or organization if there is not one already. •Provide a forum for congregational families that include People of Color to engage in an open conversation with leadership to share their experiences in the congregation and what needs they see. Allow individuals and families to self-identify and indicate their desire to be included in the conversation. •If you are a Jew of Color, or a Person of Color who is part of a Jewish family, consider sharing your experiences with your clergy and congregational leadership to help them understand how your congregation or community might be more welcoming and inclusive. •Be aware of how you greet people and if your assumptions about them are because of their race. Assume that all people coming to a synagogue are either Jewish, related to someone who is Jewish, or interested in learning more about Judaism. Initiate a conversation about racial and cultural diversity with those who serve as greeters and ushers. Make awareness of Jewish racial diversity a required conversation in the training or orientation for all who serve as greeters or ushers. •Review your congregation or organization’s programmatic calendar with the appropriate lay and professional leaders to ensure that offerings are representative of the diversity of the Jewish People. Invite scholars, authors, and creative artists from diverse Jewish backgrounds to offer programs at your congregation. Plan a congregational program that focuses on the experiences of Jews of Color, e.g. an author night, film viewing, musical program, or worship service. Advertise widely for anyone who is particularly interested in the topic to join the planning team to encourage diversity in the planning team. •Work with the appropriate synagogue or organizational leadership to ensure that the language and photos on your website, publicity materials, membership packet, religious school communications, etc. reflect the diversity of the Jewish community. •Make Jewish racial and cultural diversity visible in our physical space, through photographs, posters, books. Highlight diversity in Jewish ritual objects on display and in use in my congregation. When offering “Jewish food,” broaden the menu to include Sephardi, Mizrachi, and Ethiopian Jewish favorites. •Include readings, prayers, and music in our worship that reflect the diversity of our congregation. Let your clergy know that this is important to you. •Highlight diversity in our religious school curricula and settings. Let your religious school and youth leaders know this is important to you. Work with volunteers and staff of your congregation’s early childhood and families with young children programs to ensure that children’s books, dolls/ figurines, and art materials are inclusive of many skin tones and diverse Jewish ethnic and racial identities. •Both publicly and privately, support your clergy when they speak out for racial justice in sermons and in the larger community. •Initiate or participate in community, state, and national efforts advancing racial justice. Help make racial justice issue a priority for my synagogue‘s social advocacy and social justice work, because which issues the congregation supports and works for indicates our priorities and interests as a community and sends a strong statement of inclusiveness. Regularly consult the RAC’s website (www.rac.org) for updates on Movement-wide racial justice campaigns and opportunities for involvement in advocacy efforts. •Be open to being uncomfortable and having your pre-conceived notions challenged. Listen to the stories of others. Remind yourself that even if your congregation does not look diverse, your members may come from diverse families. List reprinted courtesy of Religious Action Center (RAC), an organization of Reform Judaism.